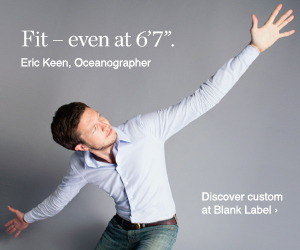 Here at www.ClothingTallMen.com, we're convinced that tall men can find stylish clothes that fit. So when we saw Esquire Magazine's list of affordable stylish Christmas gifts, we could not resist the challenge of finding all of these stylish items in tall sizes . . . The stylish gift list started with a pair of selvedge jeans. As denim afficionados will know, selvedge (or selvage) is the real-deal for denim. Woven on traditional looms, it is hard-wearing, has a distinct appearance and is used in exclusive vintage and premium jeans. To find selvedge denim in a 38 inch inseam we had to go all the way to New Zealand as the the J Crew pair featured in Esquire's list was only available up to 34 inches in length (a disappointment from J Crew, which otherwise has a good selection for tall slim men). Ande Whall is well known in denim circles for producing hand crafted denim made of renowned Japanese selvedge - all for the same kind of price as a top-end pair of mass-produced fashion jeans. Shown below is the Cougar fit. These jeans are sold 'raw' and slowly wear in, but be aware that they shrink by as much as one inch in length. Update: After writing this post, we were pleased to discover that US denim experts Self Edge offer several premium denim labels that include jeans with an inseam of 35" and longer. These include Iron Heart 301s, Dry Bones x Self Edge, Imperial SEXI14 and Strike Gold. A versatile addition to any wardrobe, a durable tweed jacket would make a great Christmas purchase. Esquire opted for a classic Brook's Brothers Donegal tweed sports jacket. That does come in a long size from 42 - 46 inch chest, but with our eye always out for a bargain we couldn't resist recommending the Executive 2-Button Harris Tweed Sportcoat from Jos. A Bank which currently has over 50% off. Made from virgin wool handwoven in Scotland it's a true classic design, updated slightly to a more modern styling. Search for item "14338" after clicking the middle picture above. Super comfortable and practical even for outdoors use, the Wallabee has moccasin style in boot form. Available in warm neutral sand suede (picture above) or in brown leather or suede. Shoebuy is one of the few suppliers to offer Clark's Wallabees in sizes up to 15 and in eleven styles, both boots and shoes. This one was a bit easier and certainly practical for the time of year. The list featured a water resistant macintosh jacket from Banana Republic which already comes in a tall size. This jacket-length rain coat comes in brown only. An alternative is Jos. A Bank's three quarter length raincoat which offers four shades and extra tall fittings up to chest size 52 inches. Search for "14412" after clicking on the right hand rain coat image below. The warm, patterned jumpers of the Fair Isles and Norway are certainly in demand this winter season, and the example here from LL Bean is simple, comfortable and available in sizes up to XXL. 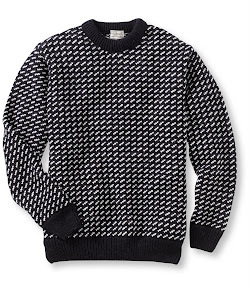 For woollens that's about the nearest you're going to get for tall sizes as we discussed in a previous post. For something a bit more elaborate, the Norwegian brand Dale have a whole range of traditional patterns in sizes up to XXL, of which only one example is shown below. I'll confess they're not to my taste but a pair of these smart leather shoes will certainly create the right impression. Wingtip brogues with the patterned leather and decorative punched holes are labor intensive to make, so they are ideal for that 'dress to impress' occasion and good to have at the bottom of any wardrobe. Allen Edmonds and Florsheim are both respected for quality leather shoes and their Lombard (pictured) and Kenwood, respectively, are safe choices. If your budget or your enthusiasm are a little lower, try the Florsheim Bristow (pictured) or the Johnston & Murphy Greenwich which come in at around $100. For size 15 wingtip shoes of all styles mentioned here visit Shoebuy.com. So, it was a bit of a challenge, but at least this selection of stylish clothing could be found in large or tall sizes. Happy shopping!